In 1925, on the third night of his first retreat, 29-year old Samuel Lewis suddenly felt a presence. 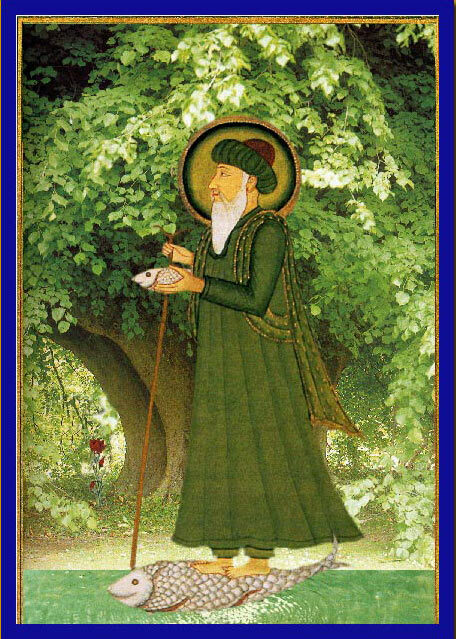 Before him came the Sufi sage Khwaja Khiḍr, the Green Master. Khiḍr offered Murshid Sam the choice between the gifts of poetry and music. Murshid chose poetry. Decades later, through the Dances of Universal Peace, he also received the gift of music. After three consecutive nights of Khiḍr’s visits, Murshid “began writing incessantly” (Lewis 1986: 29-30). And Murshid Sam, whose vigor and vitality in later years challenged his much-younger disciples, wrote that the “proof of the validity” of a visit from Khiḍr “comes first in the physical and mental vigour of the person blessed by Khwaja Khiḍr, exactly in accordance with the traditions” (Lewis 1975: 12). The great 14th-century Persian poet Hafiz also received the gift of poetry from Khiḍr after a forty-night vigil. In Muslim tradition, Khiḍr is widely known as the guide of Moses and Alexander the Great, a wali (saint), a prophet, and one of four immortals along with Enoch (Idris), Jesus, and Elijah. Murshid Sam described Khiḍr and Elijah as “the two ‘guardian spirits’ of this world and the next” (Lewis 1986: 298). Like the Qur’an’s description of Khiḍr’s gift of mercy (rahman) and direct inner knowing (‘ilm al-ladunni), Elijah heard God’s intimate “still small voice” (I Kg. 19:12). Murshid also wrote that, according to Qabbalah, Khiḍr is Jethro — the biblical father-in-law of Moses who taught Moses the Name of God in the form “I am that I am” (Lewis 1975: 207). Hazrat Inayat Khan called Khiḍr “the guiding angel of all seeking souls” (Inayat Khan: 1927, 105). Meher Baba reported that on the night St. Francis received his stigmata at Alvernia, Khiḍr visited him and gave him the “touch of grace” that made him a perfect master (Kalchuri: 14, 5011). Khiḍr’s story stands at the center of the Qur’an. The Prophet Muhammad expanded on the story, further detailing Moses’ journey with Khiḍr. In the Persian Alexander Romances (Iskandar Nama), Khiḍr appears as Alexander’s deputy and cook who gained immortality by drinking the water of eternal life. His name, however spelled and pronounced — al-Khadir, al-Khiḍr, al-Khizr (Arabic), al-Khezr (Farsi), H1z1r (Turkish), or Khidlir and Khizir (Indonesian) — means literally, “the Green”. Asked by his companions about Khiḍr, the Prophet Muhammad explained that after al-Khiḍr sat on barren land, the ground turned green with vegetation. Khiḍr’s transmission is “green,” and alive. John Matthews describes the archetype of the Green Man as “the spirit of nature … an ancient symbol of nature and fertility,” expressed in the Norse World Tree Yggdrasil, Attis and Adonis, Odin, Osiris, the King of the Wood, and the May King and Harvest King. 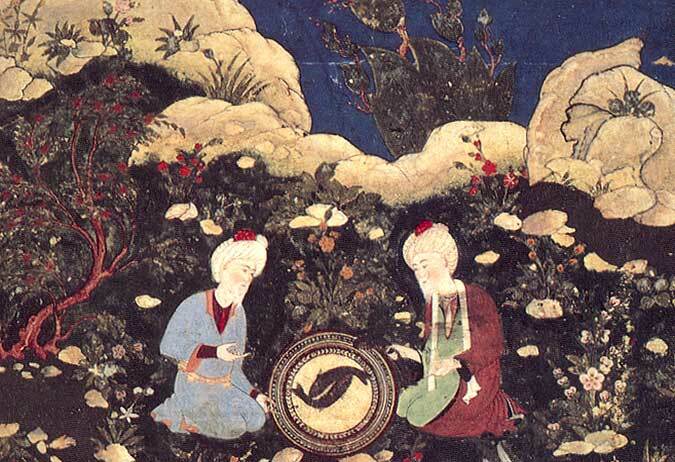 Al-Khadir (r) and companion Zul-Qarnain (Alexander the Great) marvel at the sight of a salted fish that comes back to life when touched by the Water of Life. Public domain. Khiḍr brings a gift that Sufis realize as the treasure of gnosis within the heart. Some Sufis teach that we will all meet Khiḍr at least once in our lifetime, that you will recognize him when you shake hands with a white bearded man with no bone in his thumb. In the lore of Sufi saints, Khiḍr sometimes bestows a mantle (khirqa), a primary symbol of Sufi initiation. Nizamuddin ‘Awliya received from Khiḍr a special litany. Rumi’s son Sultan Veled compared Rumi’s transforming relationship with Shams-i Tabrizi to that between Moses and al-Khiḍr. Khiḍr rescues and protects people in times of danger and distress. He saves the pure in heart from theft, drowning, snakes, and scorpions. In Indian miniatures, Khiḍr travels on top of a large fish, intimating the image of Vishnu’s first avatar, Matsya: the fish that saved the first man, Manu. In a Turkish story, an old white-bearded man hailed a tourist bus and asked the driver to wait while he went to bring his sick grandchild. Minutes passed and the old man did not return. When a passenger came forward, he discovered the driver had died. Everyone realized that the old man was Khiḍr and had saved their lives. How does Khiḍr exemplify the universal archetype of the Green Man? Numerous are the stone images of the Green Man that grace household gardens, homes, and churches. Medieval cathedrals feature Green Man faces framed with foliage. Mayday celebrations include Jack-in-the-Green and the green May King and May Queen. (Anderson) St. George and St. Michael’s color is green. The Hindu avatar Rama is green. The Tibetan yogi Milarepa turned green by eating mostly nettles. Like the Green Knight, Khiḍr is vitriolic in the alchemical sense of being a transforming agent. For example, the green sage Yoda trains Luke Skywalker. Just as Khiḍr challenged Moses, Yoda initially challenged Luke’s aptitude and preparedness for Jedi training (Star Wars V). In a martial arts film co-written by Bruce Lee, The Silent Flute (Circle of Iron), the story of Moses’ journey with al-Khiḍr appears in a martial arts setting. The Moses figure, Cord the Seeker, seeks training from a blind kung-fu master (played by David Carradine). Their journey exactly parallels Khiḍr’s story in the Qur’an. After the Flood, the god Enlil blessed him and his wife and placed them “in the distance at the mouth of two rivers. In the Alexander Romance, Khiḍr found the elixir of life in the land of darkness. This land is the alchemical nigredo. Green is also the color of Hermes Trismegistus, who imparted the secret of immortality in both the Emerald Tablet and the Grail Cup (Krater) in the Corpus Hermeticum. Anyone who gets into that cave [the cave of the Seven Sleepers of Ephesus, a story also related in the Qur’an’s 18th chapter], that is to say into that cave which everyone has within himself, or into the darkness that lies behind consciousness, will find himself involved in an — at first — unconscious process of transformation. By penetrating into the unconscious he makes a connection with his unconscious contents. This may result in a momentous change in personality in the positive or negative sense. The transformation is often interpreted as a prolongation of the natural span of life or as an earnest of immortality. The former is the case with many alchemists, notably Paracelcus (in his treatise De vita longa), and the latter is exemplified in the Eleusinian mysteries. Thus the story teaches us to find the elixir of life and the gems of wisdom in our shadow. The places that we initially cannot see in our inner journey, can impart creative, volatile, and valuable energy that we can transmute and thereby bear spiritual fruit. Because Khiḍr’s knowledge is symbolized by “water,” we learn that this flowing reality cannot be set in stone. Immortality and eternal youth cannot be rigid like rocks. What Khiḍr transmitted gave immortality to Moses and Alexander. Through Khiḍr we receive a gift of immortality — not physically perhaps — but truly collectively, culturally, and spiritually. The Sufi master Sherif Baba described Moses’ journey with Khiḍr as our own journey. Our unconscious, symbolized by the cooked fish, awakens through the revivifying waters of divine love and is transformed into a higher consciousness. Khiḍr is the God-friend who recreates people by intensive relationship and connection and so brings out of us the child of our being, a verdant soul. As trees exhale oxygen, Khiḍr exudes an inspiration of inner knowledge that bears new fruits of wisdom and discernment. As plants turn sunlight into food, so we receive from Khiḍr the light of the eternal garden. Khiḍr’s knowledge is imparted in the way flowers favor the air with their fragrance: a bestowal unseen, but felt and known. Khiḍr represents this renewal of spirit and respect for the earth and creatures. 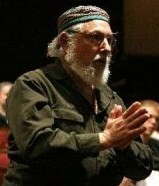 Rabbi Kook wrote of the vegetable world, “Every part of the vegetable world is singing a song and breaking forth a secret of the divine mystery” (Besserman: 1994, 2). That reality is Khiḍr. Khiḍr’s authority is natural: like nature, he is green and ever-rejuvenating. He is fresh, abundant, stunning, and unpredictable. Khiḍr does not depend on linear hierarchies; he branches out in multiple directions. And like nature, Khiḍr’s lessons include the natural disasters we do not understand: the storms, volcanoes, and earthquakes we cannot or do not want to explain. According to the Prophet Muhammad, it was when Moses thought he was the wisest man on earth that God sent him to learn from Khiḍr. That’s why in the story of Khiḍr in the Qur’an, his relationship with nature differs from that of other Green Men such as Adonis or Attis or Osiris. Khiḍr represents much more than the mystery — as profound and beautiful as it is — of the dying and resurrecting god. Khiḍr represents a further horizon: nature’s transformational possibility. Khiḍr’s actions do more than justify themselves: they open up new roads, new destinies, new possibilities. Khiḍr imparts lessons in transformation and mediates the experience of death and the possibility of attaining immortality. Further, the story of Khiḍr and Moses models the master-disciple relationship. And the story of Khiḍr and Moses whispers some of the mysteries of predestination and theodicy if we listen. And the Al-Khiḍr of your soul puts you through terrible tests, puts you through a quagmire of iniquities so you may come out unscathed, puts you through the test of drowning, through the test of fire, through the test of air, and finally through the test of truth. Here is the initiation of “acts of God,” the overwhelming tsunamis, the raging forest fires, the winds of hurricanes, and all of the stark reality such traumas transition us into. Like nature, Khiḍr is active, dynamic, and alchemical. Khiḍr is also, as the Alexander Romance hints, like a fire. Khiḍr has passed through the alchemical stages of nigredo, albedo, and rubedo. He has manifested and integrated the elements and energies of earth, water, air, and fire. Khiḍr shows us we must care for nature because — among so many reasons — what Hazrat Inayat Khan calls the “sacred manuscript of nature” is the intimate scripture that inspires fresh, new, “green,” experience for our spirit, soul, and body. Click here for Works Cited in this excerpt. Talat Halman is Assistant Professor of Religion at Central Michigan University where he teaches courses in Islamic Studies and World Religions. This article on the Green Man is derived from a body of work on al-Khiḍr to be published by Fons Vitae as Where Two Seas Meet: The Story of al-Khiḍr and Spiritual Guidance. He holds initiations in the Ruhaniat, the Sufi Order, and Sherif Baba’s Rifa’i-Marufi lineages.